Peyote Bracelet PATTERN. Odd Count Peyote Bracelet Pattern. “Vintage Bracelet Inspired”. Stained Glass Pattern Bracelet. Deco Beading. This “Vintage Bracelet Inspired” peyote pattern was designed in the same colors and shapes as a beautiful Vintage silver and enamel bracelet that I spotted online and fell in love with. The drop beads add a wonderful texture to this bracelet that make this one a real standout. This Pattern is done in Odd count Peyote Stitch using Size 11 Delica beads and 3.4mm Miyuki Drop Beads. This pattern does not include instructions for learning Odd count peyote, so it is intended for users who already know the stitch. You are welcome to sell your beaded cuff and I would be super appreciative of any credit that you could give to DecoBeading when posting your creation made from this pattern. Peyote Beading PATTERN. Odd Count Peyote Pattern. Peyote Bracelet Pattern. “Vintage Bracelet with Spacers”. Deco Beading . Peyote Bracelet PATTERN. DIGITAL DOWNLOAD. Odd Count Peyote Pattern. 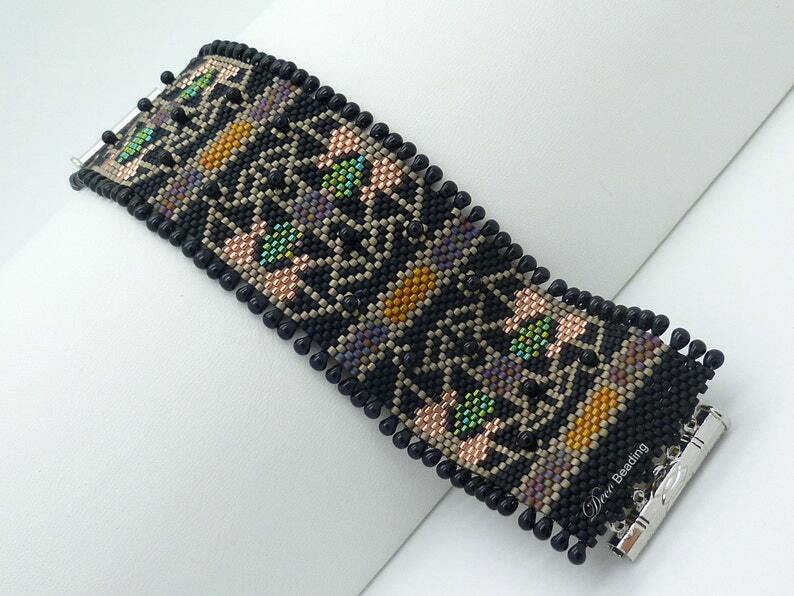 Small Peyote Bracelet Pattern. "Bejeweled in Blue". DecoBeading. Beading PATTERN. Odd Count Peyote Pattern. Peacock Peyote Bracelet. Peacock Bracelet Pattern. "Teal Peacock" bracelet. Deco Beading. Peyote Bracelet PATTERN. DIGITAL DOWNLOAD. Odd Count Peyote. Butterfly Bracelet Pattern. "Embellished Butterfly" Bracelet. Deco Beading . Beading PATTERN. DIGITAL DOWNLOAD. Odd Count Peyote Pattern. Peyote Bracelet Beading Pattern. Bead Pattern. "Bejeweled". DecoBeading . Peyote Bracelet PATTERN. DIGITAL DOWNLOAD. Odd Count Peyote Pattern. Small Peyote Bracelet Pattern. "Lacey" Embellished. DecoBeading. Peyote Bracelet PATTERN. DIGITAL DOWNLOAD. Odd Count Peyote Pattern. "Medallion" bracelet. Floral Bracelet Pattern. DecoBeading . Peyote Bracelet PATTERN. Odd Count Peyote Pattern. Black & White Peyote Bracelet Pattern. Floral Cuff. "Floral Points". Deco Beading. I downloaded the pattern, received the embellishments and items to attach the clasp, and the beads are on order. Working with this seller is smooth, easy, and fast! I can't wait to start on this project! Peyote Bracelet PATTERN. DIGITAL DOWNLOAD. Odd Count Peyote Pattern. Small Cuff Beading Pattern. "Vivian's" Bracelet. Deco Beading. Haven't started yet, but the instructions looks super detailed with lots of great photos. Can't wait to begin! Beautiful design with super instructions and photos! Peyote Bracelet PATTERN. DIGITAL DOWNLOAD. Odd Count Peyote. Small Peyote Bracelet Pattern. "All Dolled Up". DecoBeading. Paypal, Major Credit Cards, and Etsy Gift Cards. If you do not see the Paypal icon above- that is an issue with the Etsy app. My shop DOES take Paypal, but on some versions of the app, you may not see the icon. On Jewelry & Findings: I want you to be pleased with your purchase. I will accept returns within 30 days of purchase if you ship the item back to me in the same condition in which you received it. I will refund the price of the item, but not the shipping. On Digital Patterns: I cannot accept returns if the item shows to have been downloaded, so please make sure that you have Adobe Acrobat and understand how to download a PDF file BEFORE you purchase a digital pattern. Beading PATTERN. Odd Count Peyote Pattern. "Mandala 2 Blue" Peyote Bracelet Pattern. Moroccan Peyote Pattern. Deco Beading. Odd Count Peyote Bracelet PATTERN Isabel. DIGITAL DOWNLOAD. Peyote Bracelet PATTERN. DIGITAL DOWNLOAD. Odd Count Peyote. Leaf Bracelet Pattern. “Floral Beauty Embellished” pattern. Deco Beading. Peyote Bracelet PATTERN. DIGITAL DOWNLOAD. Odd Count Peyote. Small Bracelet Pattern. "Evelyn" cuff beading pattern. DecoBeading . Peyote Bracelet PATTERN. DIGITAL DOWNLOAD. Odd Count Peyote Pattern. Leaves and Fans beading pattern. Peyote Cuff bracelet. Deco Beading. Peyote Bracelet PATTERN. DIGITAL DOWNLOAD. Odd Count Peyote Pattern. Mandala bracelet pattern. "Mandala 2" Bracelet Pattern. Deco Beading.